I found this adorable little romper and wanted to build an outfit around it. The back is super cute and flirty and it seems like a great piece to kick off the spring with. I have to say that my favorite accessory here is this amazing turquoise cuff. I am dying to own one like this one day. I love those sandals too! I just bought a pair similar to them! I can't wait for summer! That cuff is pretty amazing!! Have a great weekend pretty Momma! 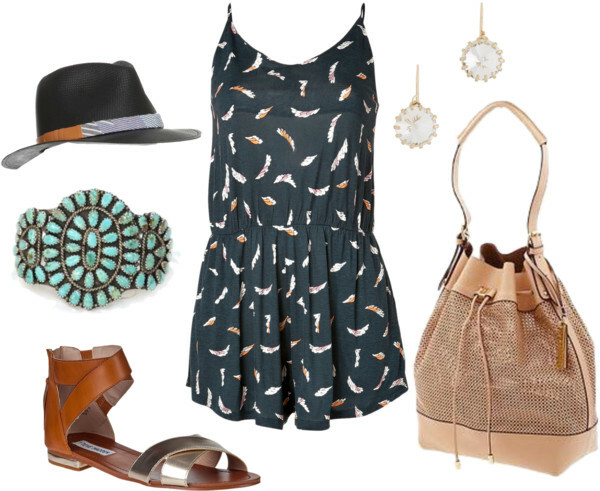 I love this outfit, this is totally how I'd like to dress all summer! I'm in desperate need of some new flat sandals, so I'll definitely have to check those ones out--super cute! Also, I feel the same way about turquoise jewelry, I LOVE it and I feel like it's one of those things you should get on vacation so it has a memory attached to it--I remember I saw a ton of turquoise when I was in Scottsdale, but it can get kind of pricey so I ended up chickening out and not making the investment--but I seriously need to one of these days because it's such a statement piece! Oh, how I love this outfit! I want to wear it for a picnic in the park, then go for a walk around the neighborhood in it and get some ice cream. It's so perfectly summer I wish it were July already! Love rompers! I have a few that I hope to get back into this summer ;) We'll see. Wow, love this outfit! I am a huge fan of rompers - so comfy and light in Summer. This is a great Spring outfit. This is so right up my alley! Love it all!